From the crocus sativus we obtain the extremely pure saffron of San Gimignano, a precious spice since the Middle Ages, also known as “the red gold” because of its value and colour. 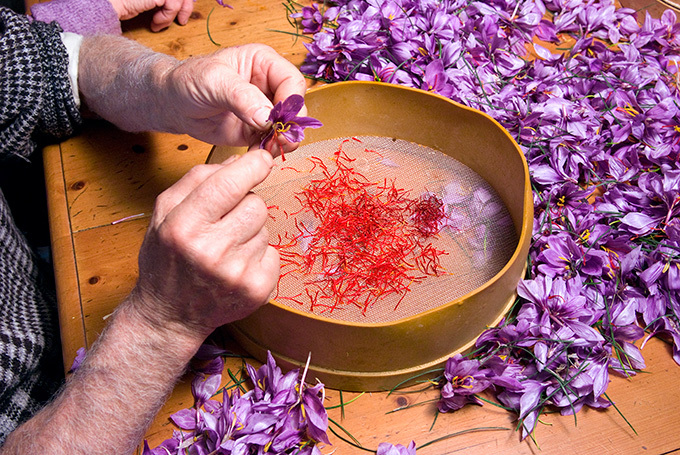 In November, saffron flowers are patiently harvested and cleaned by hand, then the stigmas are dried near the fireplace. It is a long and tiring job, but also fundamental in order to maintain the highest quality possible. In the two wooden areas of the farm, our bees fly from flower to flower to produce an excellent honey. The honey we produce is called miele millefiori, meaning that it is made out of many different types of wild flowers.